Typical tune-up consists of the removal and cleaning of the burners and flame sensor. Inspection and cleaning of the pilot assembly / thermocouple or the electronic ignition system. The last type of igniter and most common type of igntion is the hot surface igniter. They have a fairly specific useful life and usually shows signs prior to failure. The furnace cabinet is vacuumed including the burner and blower compartments. The combustion air screen is also vacuumed on high efficiency furnaces. The condensate drain is sucked clear to prevent any obstructions. 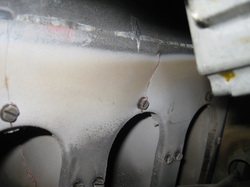 The heat exchanger is inspected and if necessary a combustion analysis can be performed. The heating system is cycled verifying proper operation of the furnace and its safety devices. 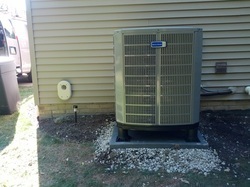 Tune up typically consists of verifying a clean air filter, verify proper refrigerant charge and if required add or remove refrigerant to ensure optimum efficiency of your cooling (and heating if it's a heat pump) system, as well as washing the condenser coil. Based on the refrigerant temperatures and pressures we obtain we can also ensure maximum reliability ensuring your system isn't working harder than it needs to. While onsite we always give the system a visual inspection inside and out of the home to ensure we eliminate any possible issues, often times before they occur. Aprilaire air filters are stocked on our truck and we're happy to sell them well below market value offering you the best value for your money! $300 Columbia Gas HEHSR Program is offering an instant rebate of $300 when you replace your furnace with a 96% or better furnace. If you're a Columbia gas customer (Some of Cuyahoga, Lorain, and Medina County residents are Dominion) you can reduce the replacement cost of your 96% or better furnace by $300-1000. This makes your furnace more affordable and opens the door for increased energy savings, optimum comfort, and the potential for better air quality as well as home automation options. Several manufacturers have been putting out 4" wide filters that have approximately an 8-11 MERV rating. If you have something like this (typically 16 x 25 x 4 or 20 x 25 x 4) this is the perfect opportunity for you! A free upgrade allowing you to use a true MERV 13 filter. The upgrade kit is free but does not include the new air filter. We stock these and are happy to help guide you to the right filter (4 filter options).